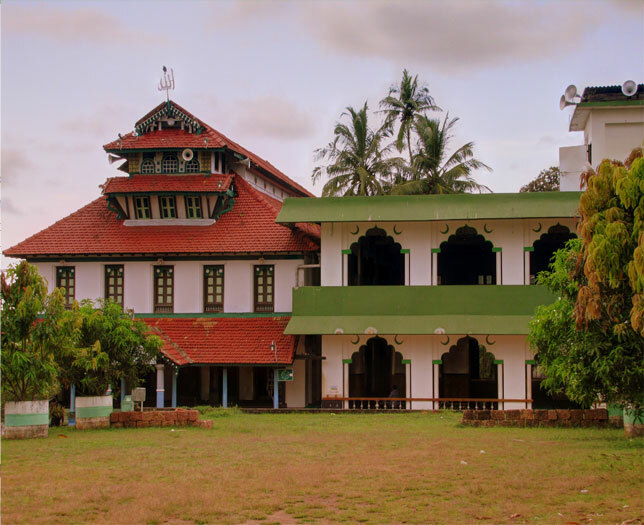 Malik Ibn Dinar mosque is located in Thalangara in Kasaragod district and is believed to be founded by Malik Ibn Dinar who was an Arab missionary. He is believed to have bought Islam in India. The mosque was erected in A D 642. This historical mosque is one of the main attractions of this district and is considered as a sacred place of worship by the muslims of this region. The tomb of one of the descendants of Malik Ibn Dinar named Malik Ibn Mohammed is in this mosque. The mosque is constructed in typical Kerala style of architecture with huge beams and is double storied. Arabic writings can be seen carved on pillars and beams. One of the main features of this mosque is that the floor is done using the marbles that Malik Ibn Dinar has bought from Mecca. The mosque founded by Malik Ibn Dinar was a small one with thatched roof and it was later renovated to the structure that is found at present. When the mosque was reconstructed the original marbles and some doors were retained. A festival is conducted here annually in memory of the arrival of Malik Ibn Dinar. Another festival is held once in 3 years, which is conducted in memory of the death anniversary of Malik Ibn Dinar and is called Uroos. Thousands of pilgrims gather here for this festival. During the Uroos festival, the poor are given food and cloths.